Biennial – a 2 year life cycle for cane growth and fruit development. Crown – the point just under the soil where the roots join the base of the canes. The crown is made of woody tissue. Primocane – a year 1 cane that grows from crown or root buds (in some cultivars) during spring and summer. They will produce flowers and fruit in Year 1. Lateral branch – grow from buds along the length of the primocane during year 1. Floricane – the primocanes from year 1 become floricanes in year 2 after over-wintering. They will flower, fruit and die in year 2. 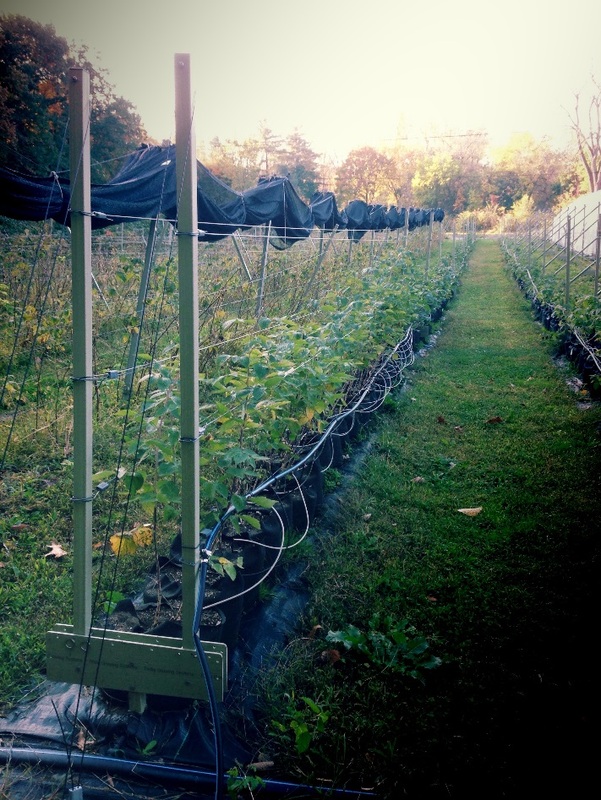 Your choice of raspberry type (floricane- or primocane-fruiting) and cultivar (red, yellow, black, or purple) will determine some of the cultural practices needed to maintain the plants year after year. However, all cultivar types will have higher yields and less disease problems with use of the AVTM trellis system and well-timed pruning events. In general, plants should be spaced 1-2 feet apart in 2 feet wide beds. One foot spacing will provide more yield the first and second year. Follow the nursery’s planting instructions that come with your plants. If you are using landscape fabric to cover the beds, cut out a 12 to 14 inch wide area running the length of the bed to expose the soil. Primocanes will emerge yearly from soil in this exposed area. Red and yellow raspberries will send up primocanes from buds on the crown and roots to fill in this entire center strip of soil while black and purple raspberries will send up primocanes from the crown area so they will tend to remain more in their original planting location. Primocane management is very important to make sure you get high fruit yields each year. During planting year let the plants grow as much as they can to establish well. Keep the AVTM trellis in the open position as much as possible to allow maximum light and air exposure. 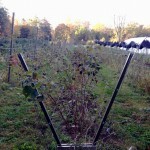 Black and purple raspberry primocane tops will require pruning throughout the summer as they can grow up and over the top trellis wire until the tips reach the ground and tip root. To minimize the risk of disease, it is best to prune when dry weather is forecast for the next 3-4 days. For floricane-fruiting raspberry varieties, pruning the top 3 – 4 inches of primocane growth when they are between 4 and 5 feet high will stimulate lateral growth and result in higher yields. Pruning away more growth than this from the primocanes can increase the risk of disease, such as cane blight, because the cane diameter will be larger and need more time to heal properly versus a smaller diameter cut cane. To reduce winter injury, prune in late fall at a height just above the top trellis wire. Primocane-fruiting (PF) raspberries will produce a small harvest towards the top of the canes this year while floricane-fruiting (FF) raspberries will not produce fruit this year but will instead fruit next year on canes that have over-wintered. 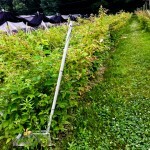 In late fall/early winter, you have two options for PF raspberries – either cut away the cane portions that fruited this year and get a second crop on over-wintered cane remnants the next year OR mow the primocanes down to 1 to 2 inches and to get a bigger crop on next year’s primocanes. 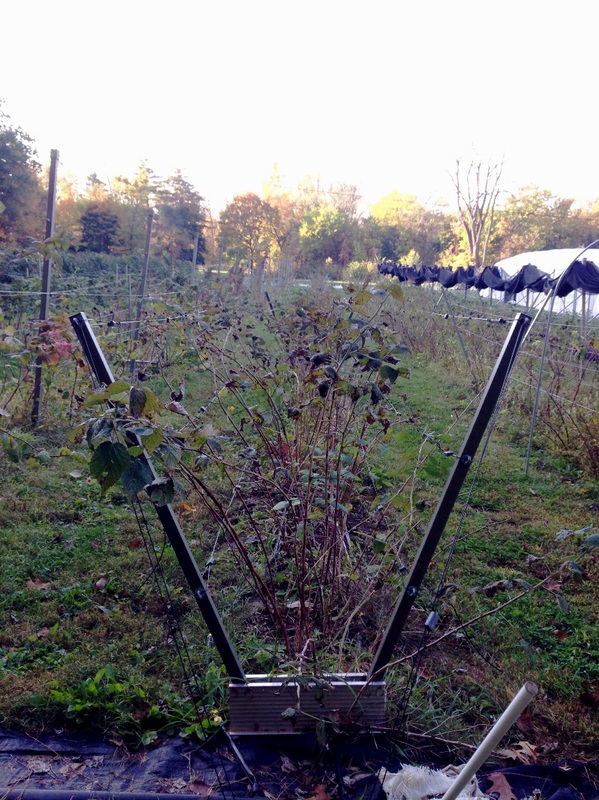 For PF and FF canes that will over-winter, attach canes to the trellis wires to reduce risk of winter breakage. You should also trim the laterals branches so they are 6 to 12 inches in length (depending upon raspberry variety). This will encourage plants to produce larger, higher quality fruit next year. Finally, there should be 4 to 6 inches of space between canes. You will want to keep the largest, healthiest canes and either prune out excess canes at this time or wait until early spring to assess winterkill and prune out accordingly. Putting the trellis in the closed position at this point will help protect canes from desiccating winter winds. One of the first tasks in late winter/very early spring is to open the trellises and give the plants a delayed-dormant spray of lime sulfur/Sulforix. This is one of the most important fungicide treatments of the season as it will control over-wintered fungal spores and insects such as mites on the plants. The next important fungicide treatment occurs during flowering. You will want to apply a product to prevent gray mold. Gray mold is caused by the Botrytis fungus which infects flowers and can result in significant declines in post-harvest fruit quality. Visit our Resources page for sources of information to learn more about raspberry pest management in your growing region. As the season progresses, keep the trellis in the open position to maximize light and air exposure to all parts of the plant canopy as well as the middle areas where new primocanes will emerge from the soil. 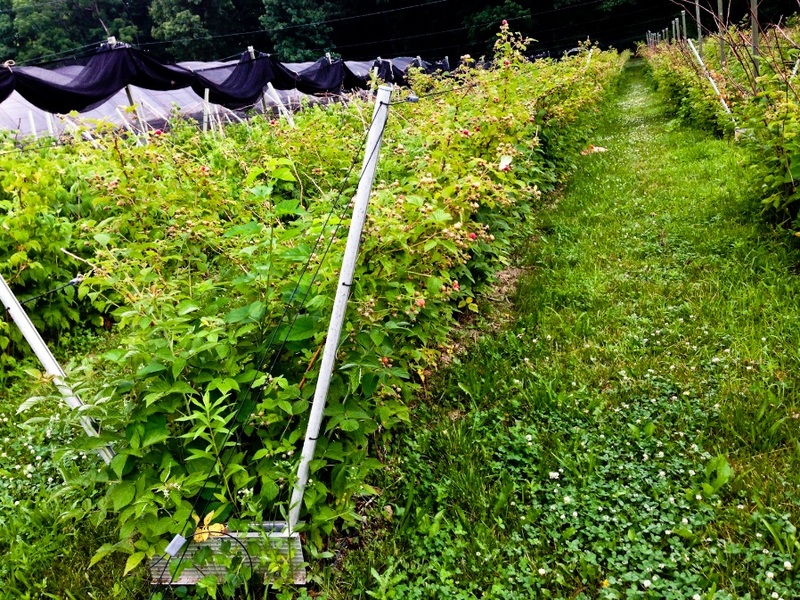 There is another option you may want to consider if you grow PF raspberries and only plan on harvesting a fall crop and mowing the spent canes down at the end of the season. Keep the trellis in the closed position until bloom time and then in the open position for the remainder of the season. This will encourage plants to place flowers (and eventually fruit) on the outer parts of the plant which in turn makes harvesting easier. Spent floricanes need to be removed at the end of the season. If your plants suffer from any diseases, you should remove the floricanes immediately after harvest to prevent disease spread. Otherwise, remove floricanes in very late fall/early winter to give the plants plenty of time to move nutrients from the canes back to the crown and roots to prepare for winter dormancy. Once again you will want to attach primocanes to the trellis wires, prune primocane tips and lateral branches, and close the trellis to end the season.